It is indeed a common problem where most of us find it incredibly tough to wake up every morning. We always end up waking up when half the day is already over and then end up brooding about how much time we have wasted. Trying to become a morning person is not going to be easy on the first few weeks but gradually things will get better when you realize what wonders it is doing for you. Being a morning person not only facilitates you to get many more things done but it is a much healthier alternative rather than rising late. Here are some ways on how to become a morning person and love it. 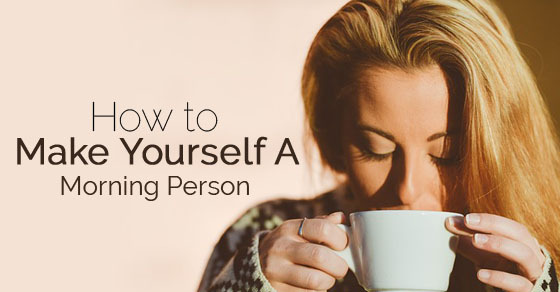 How to Make Yourself a Morning Person? If you have the intention of becoming a morning person then it is very important to ensure that you get enough sleep the previous night. If you are suffering from lack of sleep and still attempt to be a morning person then that is something which is going to take a toll on your health. How will you be able to wake up happy, rested and rejuvenated if your body has not had the adequate number of hours of sleep? Ideally one should have roughly 7- 9 hours of sleep, anything less is simply too inadequate. If you go to sleep without finishing the stipulated work which you needed to do then it is unlikely that you will even get sleep in the first place. If you do not get sleep then how can you expect to wake up early the next morning? For this very reason having a proper routine goes a long way in helping one to become a morning person. Yet this having been mentioned, it is important that you don’t just make a routine, it is very important that you implement this routine to the most minute detail. Always try to finish your tasks at the right time. It is a well-known fact that our bodies do need time to adapt to certain changes and any sudden changes in our time table is bound to affect the health of our body. So to help you gradually get into the flow, you should try sleeping just fifteen minutes earlier than you usually do and then getting up fifteen minutes earlier. As time goes by you can increase the amount of time at either end. Doing this helps you to train your body and adapt itself in a proper manner. Doing this is really one of the best ways on how to become a morning person. These little adaptations will go a long way without you even realizing. A morning person is one who is very relaxed. Chances are that such a person will always have his head on his shoulders. So in order to become such a calm morning person, it is important that you relax your mind the night before and put yourself at ease. So before you go to bed rather than listening to blaring music, playing with your mobile phone or even reading a complicated book, it is advisable that you lie down and listen to some soft music or even have a gentle chat with a loved one. In addition to this, avoid going for late night parties too often as it is bound to give you a hangover the next morning. It is obvious that the biggest obstacle to becoming a morning person is the actual task of waking up. Most of us have the urge to just turn around and go back to bed when we listen to our annoying alarm each morning. If such is the case with you as well, then you should experiment for a couple of days and find out which kind of alarm suits you the best. Some people find that a loud alarm jerks them out of their sleep, whereas for other people such noise in the morning is bound to instantly give them a headache. Other people feel that a soft gently music is just fine to start the day on literally the ‘right note’. As mentioned above getting up is the biggest challenge which presents itself to us waking up and at such a time the best thing to do, to help you train as a morning person is place your alarm clock away from your bed so that you are not tempted to hit that snooze button on your alarm clock or phone. Ensure that you keep your alarm away from you such that you are forced to physically get out of bed and turn it off. This very act of walking to the alarm is bound to wake you up a fair bit and you will no longer be able to even get back to deep sleep so easily. A right kind of routine as stated above is ideal for helping you become a morning person. One of the best ways on how to make yourself a morning person is if you actually get some of your morning jobs over the night before. For example, prepare most of your breakfast the previous day. Ensure that the breakfast is fun and refreshing so that you look forward to eating it in the morning. Iron your work clothes and lay them out ready for your work or college. Things like this are going to encourage you to get up and be very cool-headed in the morning. The best way on how to become a morning person is by keeping on telling yourself that setting out early is going to allow you to return early as well. Very often when we reach work earlier we are able to finish all allotted work within the stipulated time then you do not have to stay late at the office trying to meet the deadlines which have been stipulated. Doing this is bound to serve as an incentive to spur you on. As a result of doing this, you will be known as a very responsible and conscientious worker who is never late when it comes to handing in files or projects. Having the right kind of diet goes a long way in helping one live a healthy and proper lifestyle. In order to become a morning person, it is important that you eat and drink right in order to avoid any bodily issues. If you eat a meal which is too heavy the previous night then you are bound to get up feeling rather stuffed and ill. If you eat the right kind of food and do not immediately go to bed after a full meal then you can get up fresh and active and your body will even have plenty of energy. Having a glass of water will help you start your morning off well. Tempting yourself by thinking about all the wonderful things you can do when you get up is bound to help you when trying to become a morning person. One of the best things about being an early riser is that you can get to watch the sunrise. Watching the sunrise is a beautiful thing indeed and it is bound to fill you with a great deal of goodwill, optimism and hope. You can become a morning person by simply telling yourself how wonderful it would be to catch the sun rising each morning and feeling wonderful that each new day carries with it a number of opportunities for one and all. It is at the time of the morning that we are most productive and most mentally active and tasks which would have taken us hours to do at night will now take us simply some minutes. The silence and serenity at this hour of the morning when most of the world is fast asleep is bound to facilitate you to get your job done much better. So this is a very effective way on how to become a morning person. Even some household tasks can be done so that right from early in the morning your house looks spick and span. Once you have woken up from your sleep and your mind is very fresh you can use the time to think about urgent and pressing things which have been playing on your mind. None of us live tension free lives and all of us need some quiet time to contemplate on things which are happening in our lives. You can train yourself into becoming a morning person by thinking about how much you can be able to think about during the morning. Once you think about the problems sufficiently you can even try and come up with the necessary solutions to them. Thinking about how to become a morning person? Just try out some fun and effective waking up methods which are bound to wake you up with a smile on your face. You can put on some music and do a little dance. You can sing along to your favorite song, you can even jump into the shower for a cold bath. Little things like this go a long way in brightening up your mood and to some extent you even start looking forward to waking up every morning. Morning people are those who make the most of the early hours of the day and this time to catch up with some personal time alone. Exercising is great to set the pace for the rest of the day and it also helps your body get fitter. For many people, exercising and working out gradually becomes a part of their system and they feel incomplete without it. It is for this reason that when you start exercising in the morning that you will automatically be training yourself to become a morning person. Lastly, it is important for you to understand that when you make your mornings fun and interesting then you will feel like getting up. Once you stick to your routine, over time you will get into the habit of getting up early and soon enough you will be getting up even before your alarm goes off. This is the wonder of the ‘body clock’. These are some of the easiest ways on how to become a morning person. Morning people are not just more productive and methodical in all that they are doing but they are also very happy as well as pleasant. In today’s fast-paced life, it is rare that any of us get any time to ourselves and we need to make the most of every moment which has been given to us. It is because of this that we should try our level best to change ourselves from being night owls to morning people as this is a much better alternative. This transition is not going to be a bed of delicate roses but it is bound to be very beneficial for you in the time to come. Previous articleHow to Learn Arabic Language Quickly and Fast?